This book collects new contributions from an international group of leading scholars - including many who have worked closely with Agamben - to consider the impact of Agamben's thought on research in the humanities and social sciences. 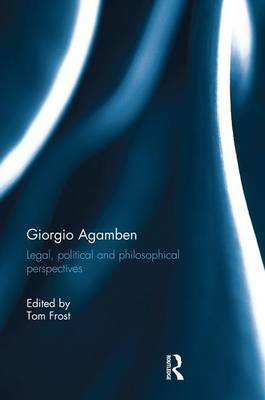 Giorgio Agamben: Legal, Political and Philosophical Perspectives addresses the potential of Agamben's thought by re-focusing attention away from his critiques of Western politics and towards his scheme for a political future. Part I of the book draws upon a wide range of issues such as legal oaths, legal reasoning and Christian conceptions of love in order to examine the potential for Agamben's work to impact upon future legal scholarship. Part II focuses on political perspectives that include references to Marx, Rousseau and Agamben's conception of the `messianic'. Theology, biology, and the thought of Gilles Deleuze, Walter Benjamin and Antonin Artaud are all drawn upon in Part III to explore philosophical perspectives in Agamben's thought. This book demonstrates the importance and originality of Giorgio Agamben, who has articulated a vision of politics that must be recognised as an influential contribution to modern philosophical and political thinking. It is a book that will be of considerable interest to many working across the humanities and social sciences.